Farting Emoji Poop Pen: Truly elegant stationery (that makes fart sounds). Writing things by hand kinda stinks, so it only makes sense you should do it with the Farting Emoji Poop Pen. 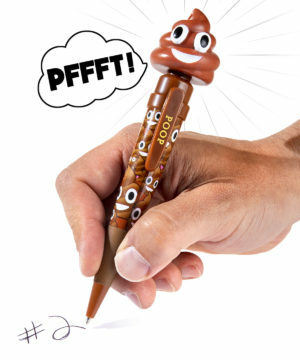 Decorated with smiling cartoon piles of poo, the pen is funny just to look at, but pressing down on the hard plastic poo emoji on the end of the pen produces nature’s funniest joke of all: a fart. The pen is loaded with seven different flatulent sounds to give you a laugh during boring homework or cut the tension (and the cheese) at work. 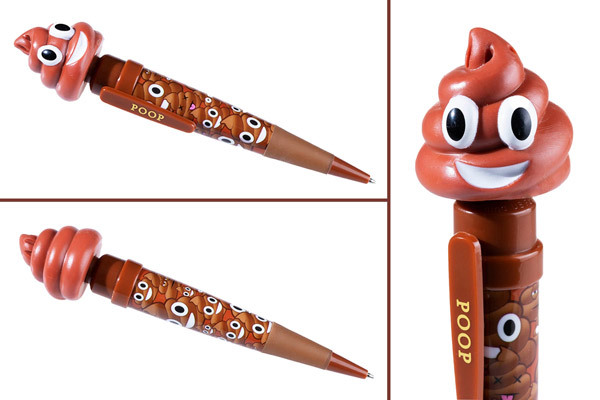 Borrowing from the popular and ever-funny text icon, the Farting Emoji Poop Pen is ready when you need a pick-me-up during your next writing session. Press down on the poo emoji to cycle through seven distinct farts sounds until you find the flatulence that inspires you (or just elicits the biggest laugh from your friends). The farts are auditory only (this ink don’t stink) so you can amuse yourself without fear of the dreaded “smelt it/dealt it” penalty. Makes 7 fart sounds! It’s also a pen. In addition to providing laughs, this potty pen is a fully functioning writing utensil with black ink that’s great for homework, signatures, and brain dumps. You’ll especially love having it in your backpocket when someone asks to borrow a pen. Add a swirl to your handwriting. Question: Do I have to hit the sound button to extend the tip of the pen? Answer: Nope. To write with the Farting Emoji Poop Pen, you twist the barrel to extend the tip. Question: Can I choose which fart sound I hear? Answer: The pen cycles through its seven sounds in order.